205 White Pine Road is located in the Aspendell area, just north of Bishop California. This friendly neighborhood is family friendly and great for people who like open land and breathtaking views. 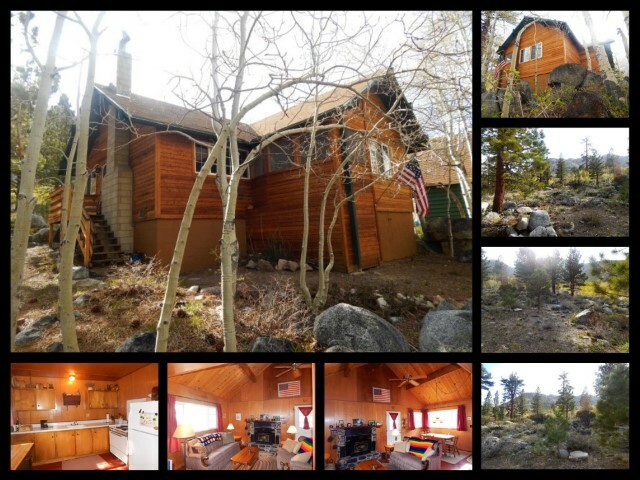 This charming cabin sits upon an Aspen covered lot backing to Forest Service land. The cabin is warm, inviting and full of charm and everything that you imagined in either your own fishing cabin or primary residence. Cathedral ceilings throughout and a large open living room with wood stove to cozy up to during the nights. Enclosed, screened patio area to enjoy the views and wildlife, or use as a sleeping area during the summer. The cabin does come partially furnished if desired. This cabin has breathtaking views all around. The home has a vacant lot next to the home that the seller would like to sell with the cabin. This give you room to build a workshop or garage to your liking and still have plenty of room. The property backs to Forest Service land for easy access for hiking and exploring. Aspendell is a beautiful small community tucked back in the Sierra Nevada Mountains. About 10 miles out of Bishop, it’s a great place that gives you space and able to escape from the city hustle. Just east of Lake Sabrina and North from South Lake with streams and ponds in between this is a great place for the outdoorsman in you. There are a variety of trails that go deeper and higher in the mountains that will let you explore some of the more remote yet breathtaking trails, streams and lakes. If you want to stay home and away from the heat you can cool off with your toes in the stream in the shade of the quaking Aspen trees.